This is my favorite way to get a lot of raw fruits and vegetables in my girls’ diet first thing in the morning. There are so many great things about green smoothies beyond the obvious health benefits: fast, easy, adaptable, portable; to name a few. The "green" refers to adding vegetable greens, such as spinach, kale or romaine lettuce, into a fruit smoothie but if you leave out dark fruit the greens create a vibrant green colored smoothie which most kids find fun especially if you give it a fun name(Kermit's Smoothie perhaps?). This is my kids' favorite version, which includes raspberries (optional in the recipe below if you want a bright green colored smoothie); dark fruit is an easy way to “hide” the spinach (worked wonders for me for years with my youngest. Now she does not care, as the great taste factor overruled the idea of spinach in her smoothies). Place the orange juice and water in the blender. Add in the frozen fruit, sprinkle in the stevia, and top with spinach. Blend until smooth and pour into two tall glasses. Sipping with a colored jumbo straw optional, but highly recommended! I will also use coconut water in place of the orange juice (one of nature’s electrolytes full of potassium). I use frozen fruit as it makes for a fast, cold and creamy smoothie compared to using fresh fruit and ice, but feel free to use fresh seasonal fruit in place of the frozen. Make sure to add in 1 cup of ice to make it cold. It’ll take, however, a bit of time to get the ice to break down. 1 teaspoon of stevia powder is plenty sweet so use less if you prefer less of a sweetness taste. Agave or honey are also good substitutes. You can leave out any additional sweetener, preferring only the sweetness of the fruit and orange juice. To make a green smoothie into a protein shake, just add a scoop of high quality protein powder (there are some really good vegan and whey-based powders usually found at a health food market or Whole Foods) or reduce the juice to 1/2 cup and add in 1 cup of Greek yogurt. Nut butters and peanut butter are also great protein add-ins. Don’t be afraid to add other nutritional powerhouses such as chia seeds, flax seeds, maca powder, hemp seeds, cocoa nibs. The combinations are endless in creating a great green smoothie! If your family is used to raw greens, try raw kale in place of the spinach or as a mixture with the spinach. You will need a high powered blender for thicker leaved greens. Some other great fruit combinations are bananas and strawberries, blueberries and bananas (my husband’s favorite), pineapple, mango and passion fruit, or peach, mango and raspberry. Experiment with different fruits! I use my magic bullet a lot as this way I can individualize; the ratio for a good green smoothie is 1 cup liquid to 1 ½ cup frozen fruit to ¾-1 cup greens. 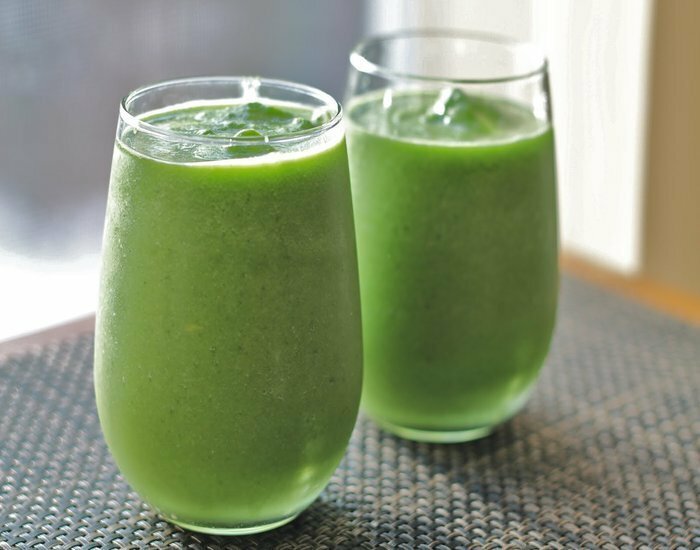 While we typically have green smoothies for breakfast, they are great pre- or post exercise (with your choice of protein added in), as a mid afternoon snack, and even a healthy alternative to dessert. Just remember that fruit is still sugar, and although most kids can metabolize these insulin spiking carbs, many adults cannot handle too many fruit based smoothies on a daily basis. If this is the case, limit to one fruit smoothie per day or make a green smoothie without the fruit and instead use only water, almond or coconut milk, yogurt, or coconut water blended with choice of protein, ice cubes, spinach or kale, and some stevia. This is my favorite green smoothie.